October 5, 2017—A team led by Cory Dean, assistant professor of physics at Columbia University, and James Hone, Wang Fong-Jen Professor of Mechanical Engineering at Columbia Engineering, has definitively observed an intensely studied anomaly in condensed matter physics—the even-denominator fractional quantum Hall (FQH) state—via transport measurement in bilayer graphene. The study is published online today in Science. "Observing the 5/2 state in any system is a remarkable scientific opportunity, since it encompasses some of the most perplexing concepts in modern condensed matter physics, such as emergence, quasi-particle formation, quantization, and even superconductivity," Dean says. "Our observation that, in bilayer graphene, the 5/2 state survives to much higher temperatures than previously thought possible not only allows us to study this phenomenon in new ways, but also shifts our view of the FQH state from being largely a scientific curiosity to now having great potential for real-world applications, particularly in quantum computing." The Columbia team has now observed this same state in bilayer graphene and appearing at much higher temperatures? ?reaching several Kelvin. "While it's still 100 times colder than the freezing point of water, seeing the even-denominator state at these temperatures opens the door to a whole new suite of experimental tools that previously were unthinkable," says Dean. "After several decades of effort by researchers all over the world, we may finally be close to solving the mystery of the 5/2." One of the outstanding problems in the field of modern condensed matter physics is understanding the phenomenon of "emergence," the result of a large collection of quantum particles behaving in concert due to interactions between the particles and giving rise to new characteristics that are not a feature of the individual parts. For instance, in superconductors, a large number of electrons all collapse to a single quantum state, which can then propagate through a metal without any energy loss. The fractional quantum Hall effect is another state in which electrons collude with one another, in the presence of a magnetic field, resulting in quasiparticles with potentially exotic quantum properties. "Think of trying to make your way through a crowd at a rock concert where everyone is dancing with a lot of energy and constantly bumping into you, compared to a ballroom dance floor where pairs of dancers are all moving in the same, carefully choreographed way, and it is easy to avoid each other," says Dean. "One of the reasons that makes the even-denominator fractional quantum Hall effect so fascinating is that its origin is believed to be very similar to that of a superconductor, but, instead of simply forming cooper pairs, an entirely new kind of quantum particle emerges." "Demonstration of the predicted 5/2 statistics would represent a tremendous achievement," says Dean. "In many regards, this would confirm that, by fabricating a material system with just the right thickness and just the right number of electrons, and then applying just the right magnetic fields, we could effectively engineer fundamentally new classes of particles, with properties that do not otherwise exist among known particles naturally found in the universe. We still have no conclusive evidence that the 5/2 state exhibits non-abelian properties, but our discovery of this state in bilayer graphene opens up exciting new opportunities to test these theories." "We needed a new platform," says Hone. 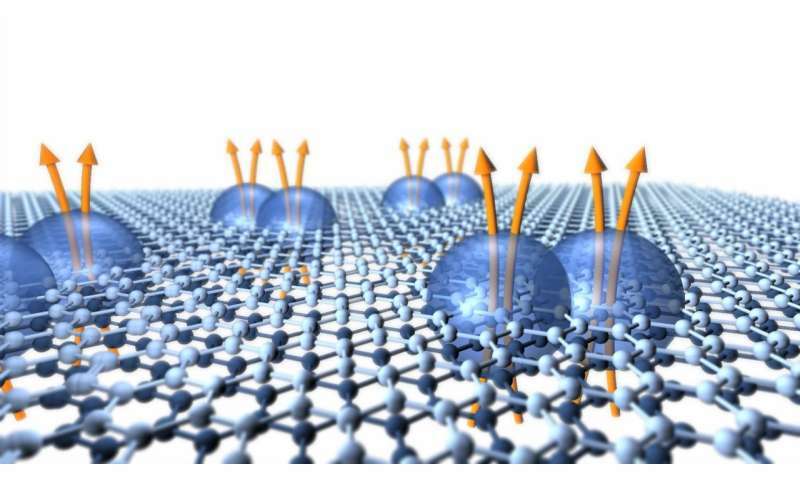 "With the successful isolation of graphene, these atomically thin layers of carbon atoms emerged as a promising platform for the study of electrons in 2D in general. One of the keys is that electrons in graphene interact even more strongly than in conventional 2D electron systems, theoretically making effects such as the even-denominator state even more robust. But while there have been predictions that bilayer graphene could host the long-sought even-denominator states, at higher temperatures than seen before, these predictions have not been realized due mostly the difficulty of making graphene clean enough." "By tilting the sample with respect to the magnetic field, we were able to provide new confirmation that this FQH state has many of the properties predicted by theory, such as being spin-polarized," says Jia Li, the paper's lead author and post-doctoral researcher working with Dean and Hone. "We also discovered that in bilayer graphene, this state can be manipulated in ways that are not possible in conventional materials." The Columbia team's result, which demonstrates measurement in transport—how electrons flow in the system—is a crucial step forward towards confirming the possible exotic origin of the even denominator state. Their findings are reported contemporaneously with a similar report by a research group at University of California, Santa Barbara. The UCSB study observed the even denominator state by capacitance measurement, which probes the existence of an electrical gap associated with the onset of the state. "For many decades now it has been thought that if the 5/2 state does indeed represent a non-abelian anyon, it could theoretically revolutionize efforts to build a quantum computer," Dean observes. "In the past, however, the extreme conditions necessary to see the state at all, let alone use it for computation, were always a major concern of practicality. Our results in bilayer graphene suggest that this dream may now not actually be so far from reality." Note: These are field events, not particles, modal activity, get it, only the centers of fields exists.